A clearly defined composition is an essential requirement for medicines, because it prevents unexpected surprises regarding its effects, potency or purity. For an herbal medicine like cannabis this starts with tightly controlling and monitoring the conditions under which the plants are grown. Cannabis plants exist in many different shapes and forms, also known as strains or varieties. Besides obvious differences in plant shape and appearance, cannabis varieties differ by their specific content of cannabinoids and terpenes (see chapter 2). The exact combination of these active components present in a cannabis product defines its ultimate medicinal effect. This means that relatively small changes in cannabis composition can have significant effects on the medicinal properties of cannabis. Quality control by means of chemical characterization is the key for ensuring a reliable composition. 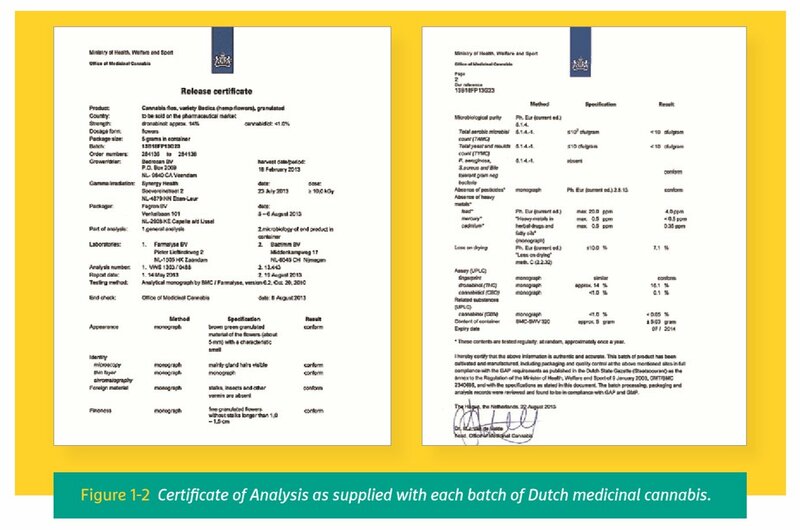 In the Dutch program, we make product information such as THC/CBD content, terpene profile and moisture content openly available for all cannabis products. Independent laboratory analysis shows each product to be free of contaminations such as pesticides, heavy metals or microbes. Complying with industrial standards for hygiene and safety (HACCP), pharmaceutical requirements (GMP), management system (ISO) and Good Agricultural Practice (GAP) is an integral part of all steps of the production chain. Cannabis plants intended for medicinal use are propagated by cloning, meaning that small parts of a so-called ‘mother-plant’ are cut off and stimulated to grow into whole plants. Also known as making cuttings, this same procedure is used by gardeners to multiply their favorite tomatoes, roses or grapevines. Cloning ensures that all plants are genetically identical, and therefore will develop the same desired and pleasing characteristics. For cannabis, it ensures that each plant has the same potential for producing the desired blend of cannabinoids and terpenes. In the Dutch medicinal cannabis program cannabis is grown in batches of about 140 plants, each batch taking a few months to fully develop for harvest. During this period, even small differences in cultivation conditions may lead to significant changes in the final content of active components. Since 2002, in Bedrocan we have systematically studied the influence of such conditions on the quality and composition of our cannabis plants. These studies included, for example, the intensity and type of lights used, plant density, humidity and ventilation of the air, watering schedule, type of plant nutrition used, and the effects of biological pest control. In this way we have learned how to carefully monitor and control the development of our plants, leading to a highly standardized product (see figure 1-1). into the mostly inactive CBN (see chapter 2). For that reason, each individual step from cultivation to final use is equally important to monitor and control. 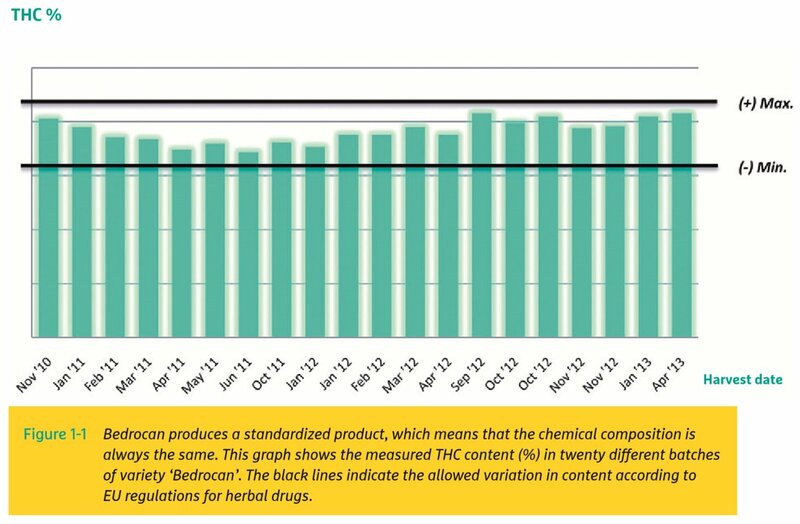 At Bedrocan, all measured parameters are carefully registered in logbooks, giving an overview of long-term trends over the course of many years. The information gathered in this way is an important resource for further scientific development programs. a Certificate of Analysis, which is available for inspection by patients and doctors (see figure 1-2). Cannabis can be called standardized when batches are consistently shown to be of the same high quality over a longer period of time. The cannabinoid composition is the most important aspect to measure for medicinal cannabis. When referring to cannabis as a medicine (as opposed to a narcotic drug), THC is usually not considered the only active component. There is mounting scientific evidence that Cannabidiol (CBD), and lesserknown cannabinoids such as tetrahydrocannabivarin (THCV) or cannabigerol (CBG) may play a role as well. Bedrocan products are therefore analyzed for a wide range of cannabinoids before they are released for use by patients. Additional tests evaluate the dutch products for general appearance (e.g. flower shape, absence of hair or insects), moisture content and terpene profile. 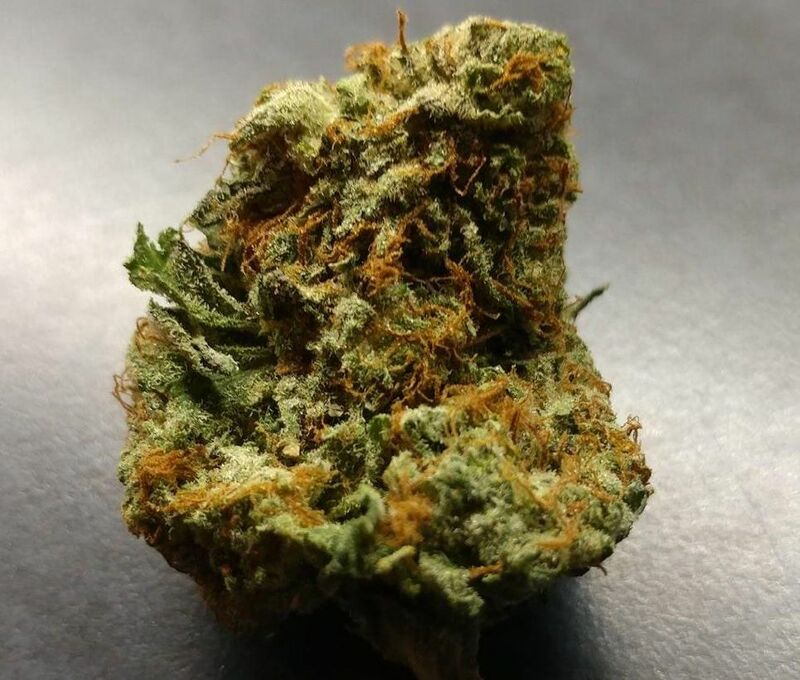 The abundantly present terpenes are thought to influence the therapeutic effects of the cannabinoids in a myriad of ways, including enhancement of cannabinoid uptake in the intestines or lungs, and influencing receptor binding or metabolism. Many terpenes also have important properties by themselves, as discussed in chapter 2. Because cannabis is grown under very warm and humid conditions, this creates the perfect conditions for microbes to develop. Manure-based fertilizers or poor hygiene standards may infect plants with intestinal (E. coli) bacteria, while contamination with fungi of e.g. Aspergillus or Penicillium species may lead to life-threatening infections especially in immune-compromised patients. Not all of these contaminations may be easily spotted by just looking at cannabis under a microscope. Some microbes, or the toxic chemicals they produce, are resistant to heat and may be inhaled during the smoking of a cannabis cigarette or while using a vaporizer. In order to guarantee the absence of microbes, Bedrocan cannabis is disinfected by gamma-irradiation. This does not have an effect on the chemical composition or the therapeutic effect of the cannabis plant. Although pesticides are widely used in food agriculture, their use is always restricted to specific crops in limited quantities. In the case of cannabis it is unclear which pesticides, if any, pose a threat to the health of patients. Thus far, no studies have been conducted on the safety of pesticides as applied to inhaled or ingested cannabis. Research has shown that many pesticides are inhaled intact when contaminated cannabis is smoked. Bedrocan does not use any chemical pesticides, but works with biological pest control methods (predatory insects) only. Patients are advised to obtain medicinal cannabis from a reliable and official source. Heavy metals such as mercury, arsenic, cadmium or lead are usually not applied to cannabis on purpose. However, they may be present in materials that come into contact with the plant during cultivation, such as soil, water, or fertilizers. The cannabis plant is known to very efficiently absorb heavy metals. After consumption, these heavy metals may accumulate in body tissues causing harm to various organs over time. All materials used for cultivation of plants at Bedrocan are specifically chosen for their safety regarding heavy metals. Cannabis is sold by weight (per gram), and demands a higher price with increased potency. To increase weight, adulterants such as sand or metal particles (lead, iron) may be added to herbal cannabis. To increase the appearance of potency, finely ground-up glass or talcum may be added to mimic the presence of glandular hairs ‘see chapter 2’. During quality control, Bedrocan cannabis is always visually inspected to ensure the purity of all final products. Clearly, inhalation or ingestion of any of these substances may lead to harmful situations by infection, poisoning or damage to the lungs. Patients are therefore advised to obtain medicinal cannabis from a reliable and official source, whenever available.